Life expectancy in England has risen by more than five years in the past two decades, yet for many people, a longer life will involve more years spent in ill-health. 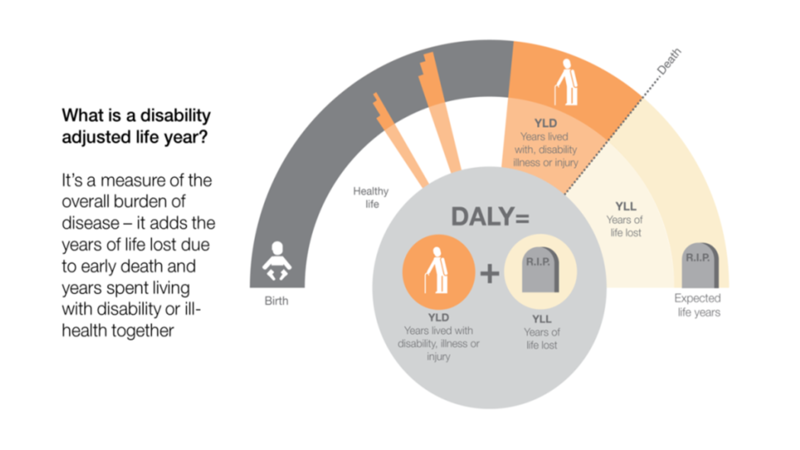 Earlier this year, The Global Burden of Disease project – an international study ranking the diseases and risk factors that cause death and disability – highlighted the toll that musculoskeletal conditions are taking on people’s health. 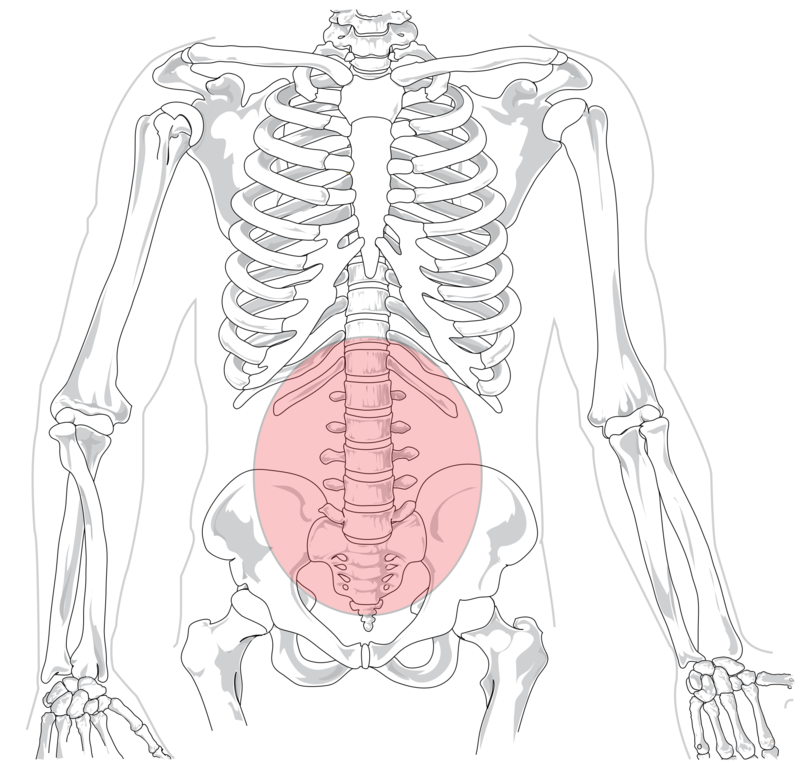 Musculoskeletal conditions are disorders of the bones, joints, muscles and spine. They can cause pain, stiffness or a loss of mobility and dexterity that can make it difficult to carry out everyday activities. Low back and neck pain is now the leading cause of disability in England for both men and women combined. Falls, which are often a result of poor musculoskeletal health, also remain in the top ten causes of disability adjusted life years – a combination of the number of years of life lost to disease and the number of years lived with disability as a result of disease. Each year 20% of people in the UK see a doctor about a musculoskeletal problem, and the NHS in England spends £5bn each year treating these conditions. As well as causing pain and disability, musculoskeletal conditions can affect people’s physical health more generally. For example, people with osteoarthritis have an increased risk of cardiovascular disease, and falls among older adults increase the likelihood of early mortality. Although many musculoskeletal conditions become more common as we age, they are not limited to older adults. A report published by Arthritis Research UK in 2014 highlighted that, in the past year, one in six adults aged over 25 had reported back pain lasting more than three months. Obesity, physical inactivity and injury are all major risk factors for back pain. Mental health conditions can also increase the likelihood of developing some musculoskeletal disorders. For example, people with depression are at greater risk of developing back pain. Here lies a vicious cycle, as musculoskeletal conditions can also have a significant impact on mental health. Living with a painful condition can lead to anxiety and depression, and depression is four times more common among people in persistent pain compared with those without pain. People with musculoskeletal conditions are also less likely to be employed than people in good health, and are more likely to retire early. Steps can be taken to improve musculoskeletal health at every stage of life, and tackling a number of risk factors could result in the dramatic improvement in the musculoskeletal health of the public. Bones, joints and muscles begin to develop before birth, and continue to develop throughout childhood. Women who have a good diet and are physically active have babies that go on to have stronger bones throughout life. Conversely, childhood obesity can put pressure on vulnerable joints, increasing the risk of MSK conditions. Regular physical activity and exercise at every stage of life can reduce the risk of many musculoskeletal conditions, including arthritis, back pain, neck pain, falls and fractures. Indeed, many of the NICE guidelines on physical activity to prevent disease or improve health are directly relevant to musculoskeletal health. A healthy balanced diet is also important for good bone health, to prevent osteoporosis and falls in later life. There is also a lot that can be done in the workplace to reduce any threats to musculoskeletal health, including adapting physical environments and work practices, as well as early interventions to identify and address problems. It’s important to note that, for the three leading musculoskeletal conditions that cause the most DALYs in England, there are evidence-based interventions that work (see table). 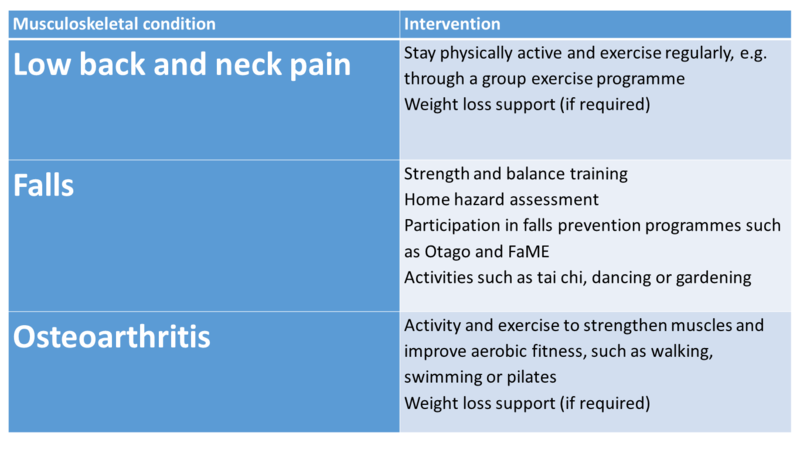 Below: Evidence-based interventions for the musculoskeletal conditions that cause the most DALYs in England, including low back and neck pain, falls and osteoarthritis. The PHE Global Burden of Disease Compare tool helps local authorities to see the burden of musculoskeletal conditions on their local populations, while the Public Health Outcomes Framework enables us to see which risk indicators for musculoskeletal disorders are high in each local authority area. Moving from evidence into action, PHE is working with partners on a number of prevention programmes and resources for people across all stages of life, as well as initiatives to help commissioners procure services to help prevent musculoskeletal ill-health. For example, the Every Body Active Every Day framework sets out our vision of everybody being physically active, every day. It details clear steps for local authorities and partner organisations to promote change and encourage active lifestyles. Our Falls prevention booklet explains how older people at risk of falls can reduce their risk and stay active. We have also developed a Falls and Fragility Fraction Population Healthcare Programme to help local authority public health teams gather and disseminate information about their local FFF system. The programme also supports local FFF initiatives, assesses and tracks performance and enables local partners to learn from best practice. Improving musculoskeletal health requires commitment from many different stakeholders, and will benefit patients, the health care system and other groups such as employers. We’re working with several partners to find joined-up ways of improving musculoskeletal health across the life course, such as our Workplace Wellbeing Charter to help employers provide workplace environments that support and encourage a healthy workforce. We’re also working with Arthritis Research UK to make sure that improving the musculoskeletal health of the population is on the agenda of both the public health community and local and national government. Bedfordshire Clinical Commissioning Group is a great example of how some parts of the NHS are already using an integrated approach to improving MSK services. Last year it commissioned one single provider for its entire MSK programme with responsibility for delivering a service that joins up with other elements of the care pathway and focuses on outcomes for patients. As health care professionals, we must work together to promote good musculoskeletal health as a way to address multi-morbidity and protect mental health and wellbeing. At PHE, we are committed to working with partners and academics to identify health interventions that really work, supported by world-class knowledge and data, and to improve the capability and capacity of the NHS and the wider public health workforce to identify and treat MSK conditions, and implement effective and efficient prevention programmes. The Global Burden of Disease study highlighted the fact that, as a nation, we must do better to reduce the burden of chronic diseases. Tackling musculoskeletal conditions and their wider impacts on health and wellbeing is a crucial step.